The new Case IH Quantum V, Quantum N and Quantum F Specialty tractors have the versatility to fit the needs of your business operation. Quantum V will be the obvious choice in narrow vineyards whilst Quantum N gives more stability when width is less critical. Quantum F provides more operator space and a wider vehicle for orchard use. In addition, cab or platform versions can be specified to tailor a tractor from the Quantum specialty range to suit your exact operating conditions. Case IH offers a range of twelve, high-performance tractors specially developed to meet the needs of vineyard and orchard customers. The Quantum V, with a minimum width of 1,069 mm, is suited to operation in the most narrow spaced vineyards. In wider spaced plantings and orchards Quantum N or Quantum F tractors are a better choice, with a minimum verall width of 1,225 mm or 1,398 mm. Inside these narrow widths are packed all the features, performance and operator comfort you will require to ensure maximum productivity. Easy access, a comfortable seat, good visibility, redesigned fender and relocated hydraulic remote levers involves less fatigue for drivers and enables them to operate confidently. Available with air conditioning and active carbon filters for superior operator protection, Quantum tractors match unrivalled comfort in the most unforgiving environments. A low cab height and optional folding safety frame version enables operation to continue under polytunnels and protection nets. A new foldable beacon for cab versions will permit to quickly lower the profile of the tractor and pass easily under trees and branches. High torque, low revving 4 cylinder engines are turbocharged and intercooled to extract the maximum from every drop of fuel. 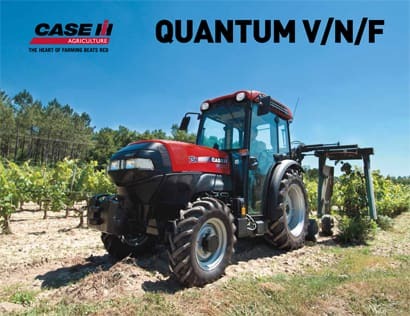 With the addition of the flagship Quantum 105 V/N/F model producing 106 hp(CV), the Quantum tractor series offers excellent performance in a compact package. You can choose between the simplicity of manual gear selection or low effort hydraulic operation. The assertive mechanical transmission offers 16 forward and 16 reverse gears with 40 kph, and is also available with Powershuttle. An optional creeper gearbox allows you to achieve slow working speeds. With a rear linkage capacity up to 2,600 kg and a separate pump serving the external hydraulic circuit with up to 64 l/min. The Quantum is never short on ability and will power the hydraulic functions and motors of the most complex implements. The remote valve system is adjustable to ensure that you can take on any job requiring complex machinery and precision operation. Three remote valves are double-acting with an option of adding an electro-hydraulic diverter function to provide a further 2 valves. Standard outlets are at the rear, but mid mount couplers are available as option to power front or mid mounted implements. Choice of PTO speeds from simple 540/540E to 540/540E/1,000, including ground speed PTO and a new power curve that is perfectly aligned to PTO work, the Quantum puts you in a position to handle the work of all seasons. Furthermore, the rated speed of the PTO was adapted to a lower and more efficient engine speed. Impressive manoeuvrability, powerful brakes, and automatic 4WD systems will meet the challenges in your operation. Additional safety in slopes offers the park lock system available with 2-speed Powershift transmission. The Quantum is equipped with a high-specification cab that gives you plenty of headroom. While the tractor is compact and narrow on the outside, you have lots of room on the inside. An ergonomic control layout and fully adjustable seat and steering wheel mean your body and mind are never under stress. The luxury seat and multi-angle steering wheel ensure you maintain a healthy posture. On cab models the front and rear windows open for fresh air ventilation. Reassuring handling. By incorporating the optional air conditioning module inside the roof, it is possible to provide this feature on cab tractors whilst retaining a consistently low operating height. The low centre of gravity ensures excellent handling on rough ground and especially on steep slopes when working along a hillside. Cab filters are mounted externally for easy access. Toughened glass panels down to the floor provide excellent all-round visibility right down to the ground. In addition to making your work easier while hitching up implements, you also have a commanding view of your valuable crops. There are no protrusions or edges on the hood or cab that might snag on branches or shoots so the Quantum brushes past without damaging your crop. Working lights integrated into the roof for excellent night vision. With slim cab pillars and rear view mirrors the vision to working implements or following sprayers is never at issue. Futhermore, the instrument cluster includes a performance monitor, an electronic tachometer, and features a combination of analogue and digital displays to give you a clear overview of the tractor’s status. Control levers and switches are positioned rgonomically, with advanced features like auto 4WD adopted from larger Case IH tractors to make things easier for you. High-performance turbocharged and intercooled diesel engines have been engineered especially for Quantum V, N and F tractors to give you the power you need. From working with a compact harrow through to complex operations with PTO-driven equipment and heavy hydraulic kit, Quantum power will deliver. Effortlessly. With twelve models ranging from 65 to 106 horsepower, the choice is yours. Choose a Quantum tractor to do the work you need done in your orchards, vineyards or vegetable fields. These engines reach maximum torque output at 1,250 rpm (3.2 litres engines) and 1,300 rpm (4.5 litre engines) so they can operate extremely efficiently at the standard speeds for working with PTO-driven machines. Quantum V, N and F engines can run on up to 100% (B100) bio diesel. These highly efficient, fuel sipping engines keep running all day long with a fuel tank capacity of 77 litres (Quantum V / N) and 90 litres (Quantum F). Exhaust emissions are low too, thanks to EURO stage IIIB compatibility, so there are no complaints from people working outside in the vicinity of these environmentally-friendly tractors. The 4.5 litre engines turn out a massive 398 Nm of torque at 1,300 rpm, so the torque rise of up to 46% translates into smooth delivery of power to the wheels, PTO and hydraulics to cope effortlessly with peak demand on slopes and in the toughest conditions. Quantum specialist orchard and vineyard tractors are kitted out with a powerful hydraulic hitch in classic Case IH style. The proven system is designed to make light work of heavy-duty tasks. Lifting power that contributes to the efficiency and profitability of your business. With a total lifting capacity of 2600 kg the hitch will easily handle your implements and machines. Mechanical hitch control is standard, while electronic hitch control is provided to ensure efficiency during tillage and soil cultivation operations. Like on larger tractors, with EHC you can set the lift height on the dial and then raise and lower the hitch automatically at the flick of a switch. Both mechanical and electronic systems are equipped with automatic draft control. The mechanical hitch system features an easy to use quick raise and lower control. Fender-mounted hitch controls allow safe and easy attachment of machines and implements, even when working on your own. In addition to the impressive lifting power of the hitch, Quantum tractors are equipped with a hydraulics system that delivers the versatility you need to do a varied day’s work. Our Quantum V and Quantum F tractors are equipped with the latest technology to convert power into torque at the wheels as you need it. Those features contributes to the efficiency and profitability of your business. On four-wheel drive versions automatic electro-hydraulic engagement of the front axle is provided to assist the driver in more demanding conditions. 4WD also engages automatically when both brakes are applied to deliver ultimate stopping power when transporting heavy loads at speed. The traction control system switches back to 2WD at speeds above 15 kph and at a steering angle tighter than 30°. Narrow engines plus a contoured hood enable the front wheels to lock at a really tight angle. A turning radius of just 3 metres is achievable on 2WD versions, making light work of turns at the end of rows, even inconfinded spaces between vines and inside tunnels.